It has been a while since we have had some new cans for sale. 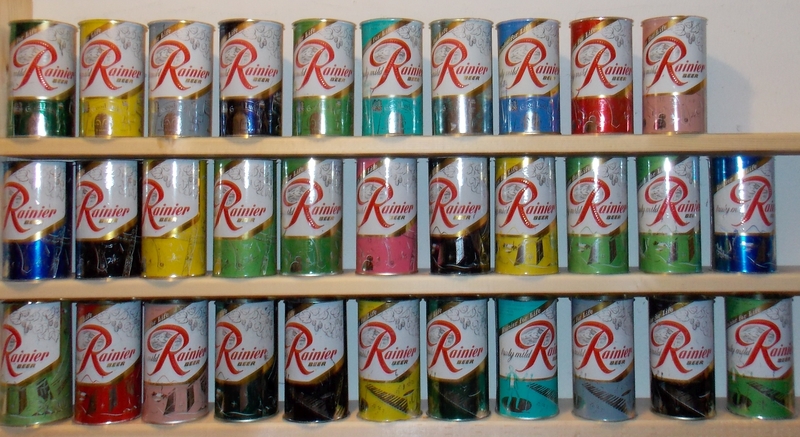 We now have a couple of hundred cans from the recent big find of Rainer Jubilee cans in Seattle. These cans are from both the Seattle and Spokane breweries. There are cans from 12 different series from the mid-1950's. The cans were locked away for approximately 60 years so there is no rust. There are various amounts of small scratches on the cans. I have taken three detailed pictures of each can to best show the condition. In 90 percent of the cases the cans are missing both the top and bottom. They were never filled, and have flanges that are ready to have a top or bottom added. About 10 percent of the cans have a silver bottom. 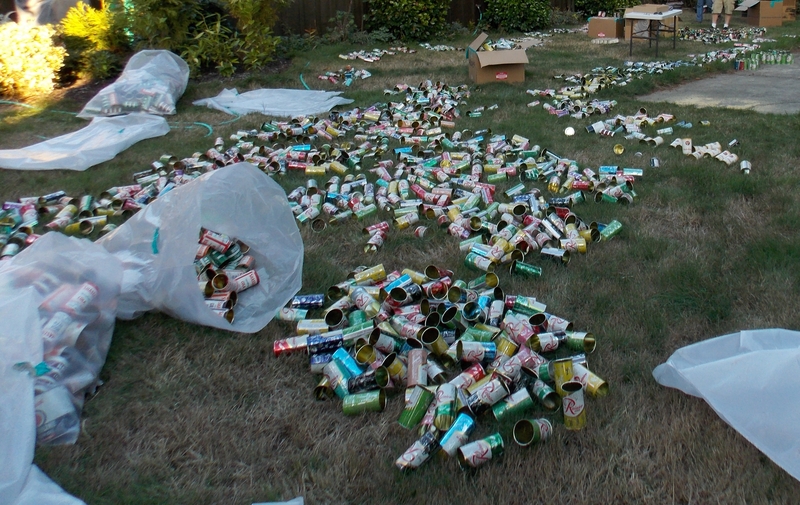 From this find, I was able to get nearly 1000 cans, and have documented 150 variations. 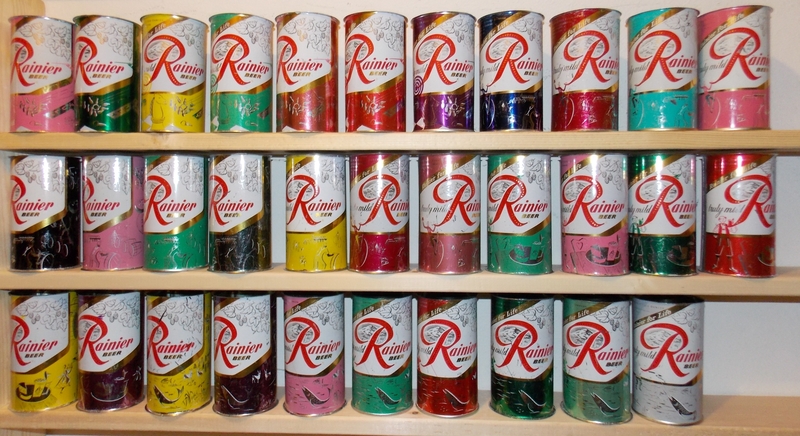 If one had to pick a brand of beer with the most varieties, it would be the Rainer cans of the mid-1950's.Below is a picture of the cans when we brought them to my backyard to sort. It was quite a site- although it does look like the lawn could use a little fertilizer. Before the big find, these cans were excepectionally rare. There would be a huge commotion if somebody brought even a few of these cans into one of our local Rainier Chapter of the Brewery Collectible Club of America shows. Needless to say this find changed that, and also changed the prices of these cans. If you can make it to one of our shows in the Seattle or Portland area, you will have a chance to see these cans in person. Prices vary depending up the condition of the can, and the scarcity. There were cans from this find where only a single example was found and others where there were a few dozen. Postage to anywhere in the USA is $4.99 total whether you buy 1 can or 100. Thanks for looking. As a collector for over 40 years, this ranks has one of the all-time historical finds. I am lucky to have been part of it. It gave me a chance to add dozens of new cans to my collection, and with the extras there are lots to share with the rest of the collecting community. Below are some of the variety of cans found. There are duplicates of most of these cans for sale...but not all. 1. 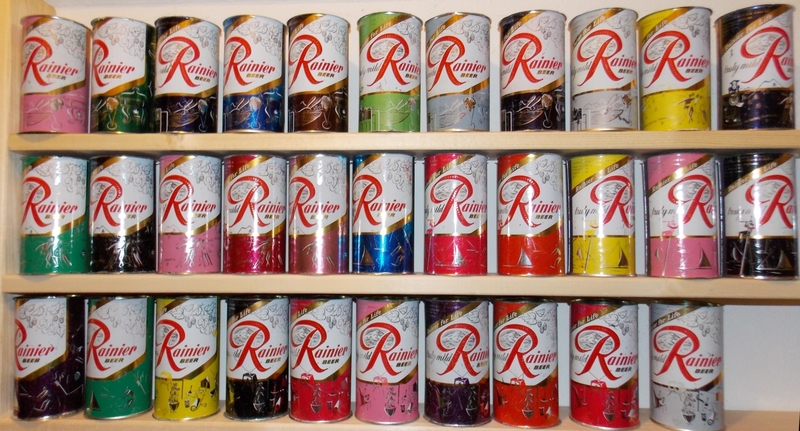 Send us an email with the lot numbers of the cans you would like to purchase. 2. We will send a confirmation email with the total price including postage of the cans. In case of two orders for the same item, the cans will go to the first order received. 3. Payment can either be via PayPal, or via a check.